Typically, when a Bridgeport City Council agenda includes a strategic planning session the meeting will last more than five hours. Wednesday’s special meeting to hold the session barely lasted five minutes. There was a good reason for it at the session held a tthe Bridgeport Conference Center. “Out of respect for President Bush and his family, we’re going to postpone this meeting outside of business items that require attention,” said Bridgeport Mayor Andy Lang prior to the start of the session, and then reiterating those words at the beginning of the meeting. Wednesday was a national day of mourning due to the recent death of 41st President George H.W. Bush as declared by President Donald Trump, which closed federal buildings and services. Gov. Jim Justice followed suit and ordered the closure of all state operations that led to the closing of all Harrison County operations. The only matter of business involved the second reading of a bond ordinance that authorizes the city to utilize up to $41 million in sales tax revenue bonds for the financing of the city’s indoor sports and recreation complex. The $41 million is higher than the initial $35 million discussed for most of the last year. The money that is going to pay for the bonds and, ultimately, the recreation facility is coming from the 1 percent sales tax that went into place July 1, 2016. The second reading passed unanimously, like it did on first reading. The initial reading took place during a special meeting Nov. 27. The bonds are part of a purchase through WesBanco Bank, Inc. According to City Attorney Dean Ramsey, the next step involves a public hearing on the matter. He said it requires a 10-day public notice that would put the hearing on Dec. 18. At that time, the paperwork for the bonds would be signed and then officially finalized the next day, Dec. 19. The strategic planning session has not been scrapped. Lang said Council will look at dates in early January and hope to set it at Monday’s regularly scheduled 7 p.m. session. 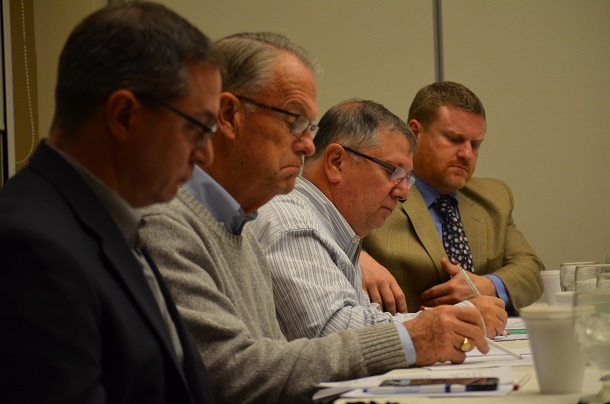 Editor's Note: Top photo shows, from left, Council members Jeff Smell and John Wilson, City Recorder Hank Murray and Council member Dustin Vincent. 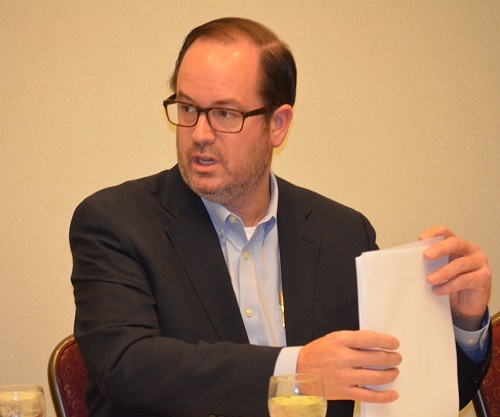 Below, Mayor Andy Lang goes over some paperwork during the brief session.